The powerful and cavernous voice of Brazilian contralto Maura Moreira was a perfect vehicle for roles such as Azucena in Il trovatore and Venus in Tannhäuser. She sang concert pieces such as the Brahms Alto Rhapsody, and sang in the 1965 premiere of the opera Die Soldaten by Bernd Alois Zimmermann. The Brazilian contralto, Maura Moreira, got her first training at the Conservatório Mineiro de Musica and with Maximilian Hellmann. After she had won a national singing competition in Brazil, she could continue her training with the help of a scholarship of the Brazilian Board of Education at the Vienna’s Musikakademie. Still during her studies Maura Moreira made her debut in 1959 at the City Theatre of Ulm as Santuzza in Cavalleria Rusticana. She won then the Verdi Concur in Vercelli and made guest appearances now in Western Europe on the stage as in the concert hall. Apart from her stage repertoire she specialised in the oratorio and in the Lieder. She had important successes in the centres of the German music life, in Austria, Holland, Belgium, Spain, Portugal and in Switzerland. Among her big stage roles ranked Amneris in Aida, Eboli in Don Carlos by Verdi, Azucena in Troubadour, and Venus in Tannhäuser. She was also an important interpreter of contemporary music. Since 1962 she was for long time member of the Opera House of Köln. There she appeared, among other things, in February1965 in the premiere of the opera Die Soldaten by Bernd Alois Zimmermann. Maura Moreira’s darkly shining voice capable of passionate drama is to be heard on several record labels. 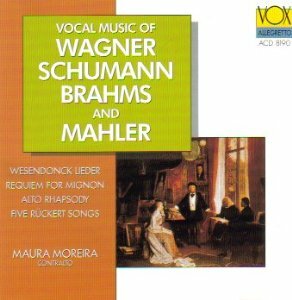 On Fono-Vox she sings the Alto Rhapsody by Johannes Brahms, Wesendonck-Lieder by R. Wagner, works of J.S. Bach, J. Haydn and Gustav Mahler, in addition Brangäne in selection from Tristan, on Wergo the integral modern opera Die Soldaten by B.A. Zimmermann.